Will our love of Nordic interiors ever end? We are going with a resounding 'no'. But like all trends that hang around for years (hygge is the prime example) we do, every now and then, come up with a new name for what is basically the same style just with a slight twist – case in point: new Nordic. So here are a few of the very best New Nordic design ideas to steal from the slightly darker, slightly moodier take on the classic Scandi style... Find more gorgeous design ideas on our hub page. You will see that texture is a recurring theme with this style. As the colours and designs tend to be kept pretty simple, a lot interest comes instead from layering textures. 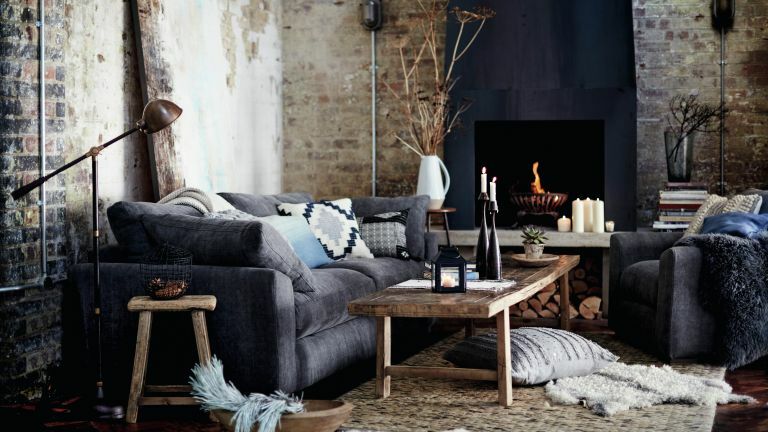 In a living room this obviously means piling up the cushions and throws in all different finishes – fur, sheepskin, chunky knit, the more the better. The same goes for the bedroom – choose bedding that has a texture to it, something like this linen bedding from Soak & Sleep and combine it with a throw in a similar shade. This super soft grey throw is from Finnish store Lapuan Kankurit, but lucky for us they ship their lovely sustainable products to the UK. The washed out look gives that gorgeous effortless feel that's very Scandi (and yes telling yourself you are embracing the Nordic trend is also a great excuse to not make your bed). While the Scandis may have mastered the minimalist white washed everything, take note that they are also proficient in adding just the right amount of colour, usually in the form of cushions, throws and accessories. Just stick to a couple of colours and choose muted hues like blush pink, grey-blue or earthy colours like forest green and ochre. This is where the whole New Nordic trend slightly varies from the more traditional Scandi inspired rooms you might be more used to seeing. New Nordic definitely incorporates darker, dramatic colour more readily than the light and airy classic Scandi style. To recreate this moodier look, try experimenting with deep blue and green paints (something like Farrow and Ball’s Vardo) and mix in elements of lighter wood and statement accessories. With new Nordic design ideas, you keep the colours minimal and let the furniture do the talking. Clean lines, simple structures and a dose of functionality pretty much sums up Nordic-style furniture, so make sure you choose pieces that reflect this. It’s pretty Mid-century in that sense, but whereas Mid-century style favours darker woods, Nordic style is all about the paler more natural finish. Both this bedside table and double bed frame are Ercol for John Lewis. The Scandis are masters of accessorising without cluttering, seriously, just flick through the Ikea catalogue and you will find hundreds of beautifully, simply curated shelves, sideboards and cabinets. The key is to mix and match old and new, curio and run-of-the-mill. Just (as always) keep the colour palette simple. The new Nordic style is very minimalist. But obviously, it’s not very realistic to live in a home that’s completely void of any un-aesthetically pleasing things, but that’s where clever storage comes in. You can create the illusion of a clean, uncluttered space, when in fact, open any cupboard and you’ll find a Pandora's Box of stuff. Choose closed storage for your unsightly knick knacks and then invest in some simple shelves, like these Austin shelves from Habitat, to display all your Nordic-approved decorations. This is a very budget friendly way to embrace new Nordic design ideas – bring the outside in. You could invest in a few house plants (we love fiddle leaf fig plants as seen below) or you could go even more Scandi and forage around your garden for bare branches, which, when stuck in a simple jar, always add a Nordic vibe to a room. Remember what we said about textures and layering? Well, same goes for your floor. Seriously, why have one sheepskin rug when you could have loads? Pick out a few rugs that are made from different materials and overlap them in the centre of the room to add some visual interest to an otherwise simple space. New Nordic design ideas sorted. If you love the idea of moody and atmospheric interior design ideas but don't want to fully commit to the dark side, the New Nordic look is definitely for you as it incorporates more dramatic shades but keeps furniture and accessories light and simple. Try painting just one wall in a deep colour (for a similar choose Farrow & Ball's Stiffkey Blue) and pair it will slimline, pale furniture and light, neutral accessories to recreate this look by John Lewis. And there it is, the word you all knew was coming. This is by far the easiest way to add a dash of new Nordic design ideas to your home – dim the lights, grab a blanket and light all the candles you own. You could even go a step further and invest in a stove - we love a classic black wood burner but white or cream ones really embrace the simple Nordic look.